Some 30 years ago scrollbars were introduced, allowing users to pane through content within digital products. At that time the mouse still used a rubber ball to track the movement of the cursor and it would be some time before the scroll wheel was introduced. Nowadays all mouses come with a scroller and dedicated buttons for user-defined actions. Also, in these thirty years, some new input devices were added to the list and there came new ways of gathering input from the user. Touchpads, trackballs, tablets (with or without the stylus), gestures, carried devices and recently the leap-motion controller introduced new ways of interaction for users to play with. As a result, nobody really touches the scrollbars nowadays. In the past we needed interaction between our cursor and the onscreen scrollbars. Today these features are well supported as devices adapted to new input method requirements. The design pattern has become integrated within our user experiences, and will fade away in time. So what about custom UI scrollbars for web interfaces, should we use them? There are alot of them out there, and to start this burn most of them lack proper keyboard interactions. Also some browsers extend the scrollbar with search verb highlighting and ALL custom scrollbars will break and fail epicly at this point. 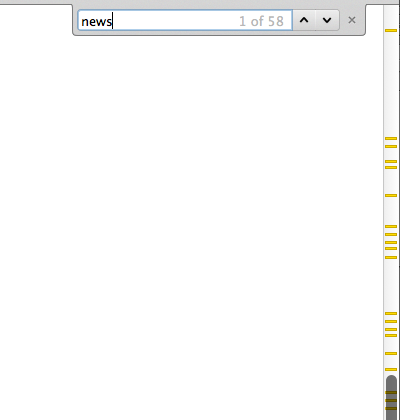 This is why I prefer to respect the human interface guidelines, and leave the scrollbars be. I have knifed through this issue in countless battles, implementing, tweaking, testing and improving custom scrollbar frameworks to conclude that this will never be worth all the effort. Creating a great default experience is a lot easier than creating a great custom one. We came a long stroll along 30 years of page scroll, one can only wonder about the ways in which we scroll into the future.